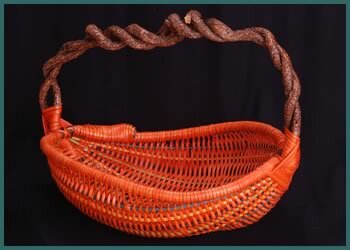 The walls of this handcrafted designer basket are woven in tangerine-colored reeds. Spokes are yellow, teal, plum, and green. The handle is twisted vines of bittersweet. 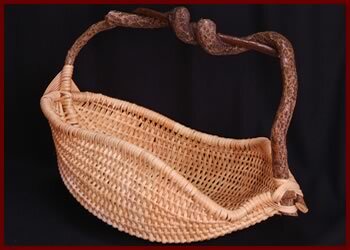 H 16" W 14" L 26"
Woven in natural reed color. Handle is twisted bittersweet vine. 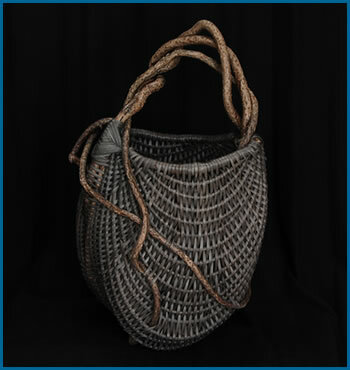 H 25" W 15" D 11"
This large and elegrant crescent-shaped basket is contoured with bittersweet vine and then woven with slate-colored reeds. Twisted strands of bittersweet form the handle.